Music is in the air more than ever this summer in Chicago. From a locally sourced music series overlooking a pond teeming with turtles to jazzy concerts hosted on the Shedd Aquarium&apos;s lakefront terrace, there&apos;s an open-air concert at an unexpected venue almost every day of the week. Here are four outdoor summer music series that you won&apos;t want to miss this summer in Chicago. The Patio at Café Brauer (2021 N. Stockton Drive), which overlooks Nature&apos;s Boardwalk at the Lincoln Park Zoo, a pond that many local birds, frogs, fish and turtles call home, is a picture-perfect spot for outdoor summer dining. 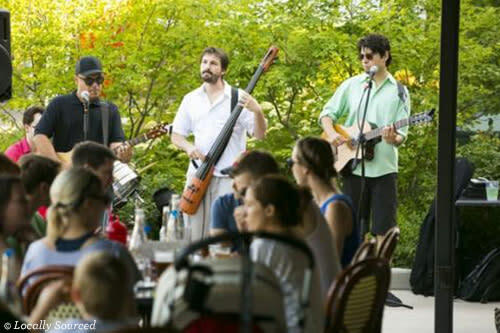 The new Locally Sourced music series makes it an even better pick for a summer date to remember: Every Wednesday, from 5:30 to 7:30 p.m., June through August, patrons are invited to experience the best in local music, beer and food in the landmark setting. Presented by the Old Town School of Folk Music, the weekly programing features everything from blues, Irish, Latin and Brazilian to folk, acoustic, jazz and the banjo. Enjoy drink specials and linger over a tasty alfresco meal. Bring your pooch, too: this series is always Fido-friendly. View the full music lineup here. The hip cocktail lounge Drumbar (201 E. Delaware Place, 18th Fl. 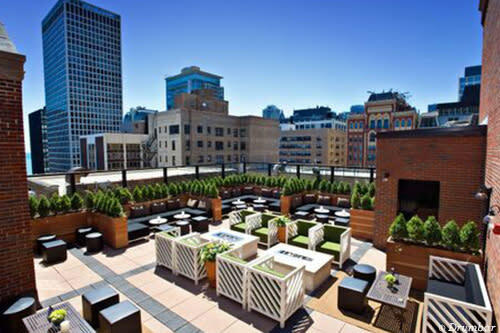 ), has partnered with grassroots music network, Sofar Sounds, to host a weekly summer concert series on one of the prettiest rooftops in the city. Summer Sounds, presented by Pernod Ricard, will be presented on Saturdays, June 17–August 26, from 3 to 6 p.m., and will host a wide variety of live, local musicians. Enjoy a full menu of summery drinks, including house made Frosé (frozen rosé), and small (Moscow Mule freeze pops!) and big bites, too. Make a table reservation by emailing cwilliams@meninhospitality.com. This festive series is destined to pack a full house! Shedd Aquarium&apos;s signature summer evening live music series, Jazzin&apos; at the Shedd, returns in 2017 for yet another summer filled with weekly concerts and cocktails. 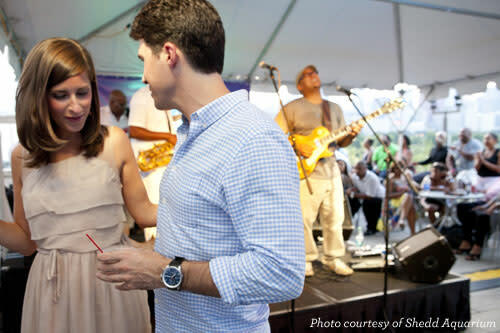 Enjoy live jazz under the stars on Shedd&apos;s scenic lakeside terrace as a rotating group of musicians encourages guests to get up and dance to the beat. Jazzin&apos; at the Shedd is held every Wednesday, June 21, through September 13, from 5 to 10 p.m., at the Shedd Aquarium (1200 S. Lake Shore Drive). Tickets are $20 at the door. Check out the full lineup here. 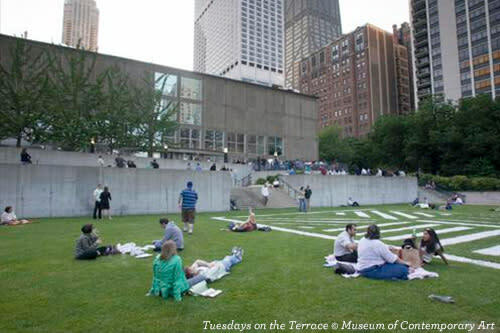 Offered every Tuesday throughout the summer, from June to September, Tuesdays on the Terrace free music series at the Museum of Contemporary Art (220 E. Chicago Avenue) highlights artists from Chicago&apos;s internationally renowned jazz community. Hosted on the museum&apos;s gorgeous John Kern Terrace Garden (or in the MCA Café in the case of rain), this is a summer music series you won&apos;t want to miss. The MCA Café will offer a simplified grill menu as well as cold beverages, wine and seasonal cocktails on both the lawn and upper terrace. Open seating is available on the terrace, or bring a blanket to relax on the lawn. Starting on July 4, 2017, the series will also host a buffet, which features a changing menu of themed dishes using fresh, locally grown produce for $30 per person. To make reservations for July–September, call in advance at 312-397-3805. View the full music lineup here. Hundreds of music acts perform around Chicago during the height of the festival season. Check out the complete Chicago festivals guide for 2017, where the biggest events by month include numerous street fests, or browse the Chicago outdoor concert guide for more shows at amazing venues like Wrigley Field and Northerly Island.